David ShinerJune 29 was a day for newcomers, up-and-comers and comebacks. David Shiner, a Shimer College associate dean coming off a 10-year hiatus from rated chess, won first place in our preview open at the Illinois Institute of Technology, with a score of 3.5/4. 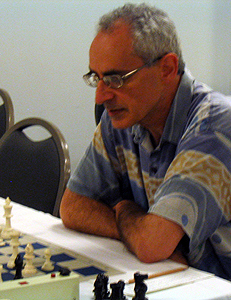 With only three prior rated games to his name, Armando Rodríguez took second with 3.0/4 (in a tie with the house player, Bill Brock). Young player Mark Jungo, a member of the Knight Moves Chess Club at the Rudy Lozano Branch Library in Pilsen, placed third with 2.5/4, scoring an upset win over his mentor, Héctor Hernández, in the first round. Click here for official tournament crosstable. If you plan on driving to the Chicago Chess Center Preview Open tomorrow (Saturday, June 29) at the Illinois Institute of Technology and haven't already reserved parking, arrive early: visitors' lot B5 is expected to fill up quickly because of another event. Follow this link for alternative parking locations (lots A4, A6, C5 and D5). Rather not pay $12 for all-day parking? We don't blame you. You can also take the 'L' to 35th-Bronzeville-IIT (Green/Red Line), the Rock Island Line Metra to 35th, the 24 (Wentworth) or 29 (State) bus to 33rd, or the 35 (35th) bus to Federal. The Chicago Chess Center is pleased to announce its second preview event -- and this one is open to all U.S. Chess Federation members! On Saturday, June 29, we're holding a four-round Swiss system tournament at Hermann Hall on the Illinois Institute of Technology campus, 3241 S. Federal St., Chicago (map). The time control is G/45 plus 5-second delay. Rounds will start at 10 AM and 12:15, 2 and 3:45 PM. Entry is $15 for Chicago Chess Center members, $25 for nonmembers. Up to $300 in prizes will be awarded (prize fund based on 30 entries). To register, send us an e-mail message and pay on the day of the event, or mail your entry to Chicago Chess Center NFP Inc., c/o William Brock, 230 W. Monroe St., Suite 330, Chicago, IL 60606. On-site registration will be from 9 to 9:45 AM downstairs in the Faculty Club Lounge. USCF membership is required; three-month memberships will be available on-site. Sets and duplicate scoresheets will be provided. Please bring a clock if you have one. The site is nonsmoking and wheelchair-accessible. We're excited to be able to present this event to you, and we hope you'll be among the first to enjoy what we have to offer. See you on June 29!